That’s what Liberians do. They make do with what they have, whether it is at work, home, or leisure. Kids don’t have soccer balls, but they do have plenty of discarded plastic bags strewn on the streets, so they wrap the bags tightly around and around to make a small “football” to kick around. They have passionate, competitive games with just homemade balls and some sticks for goals. Mothers don’t have those cute snuglies, backpacks, or strollers that our American parents have, but they take a long piece of cloth and wrap the baby tightly to their backs when they are on the move. 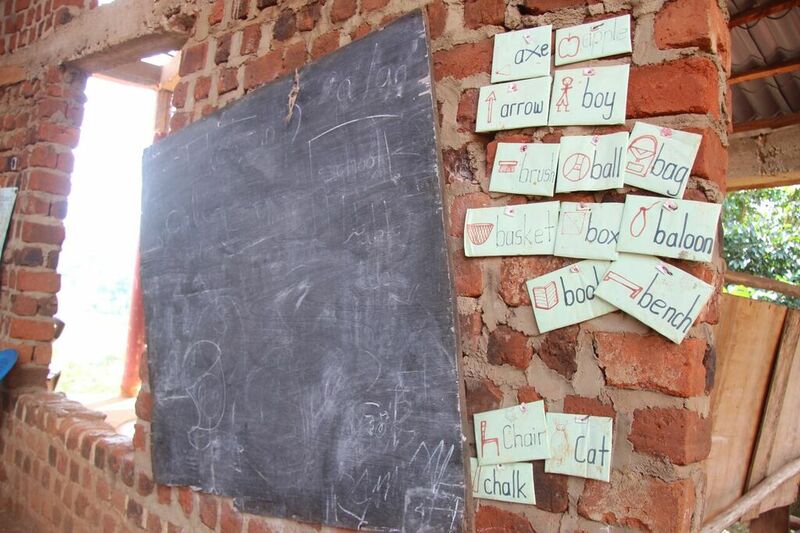 Teachers here don’t have sets of readers or textbooks to pass out for their students to use, so they take their lone, 20-year-old-discarded-from-the-U.S. teacher’s manual to write lessons on the blackboard while students copy everything into their composition books. Clinics don’t have the latest equipment – in fact, they hardly have any equipment – so if they have a newborn baby in need of an incubator, they tape together two flashlights…if they need protective gear during an infectious disease outbreak, they wear rubber kitchen gloves, a raincoat, and rain boots while they treat patients…and for lighting during a middle of the night maternity delivery, a parked car’s headlights might have to suffice. 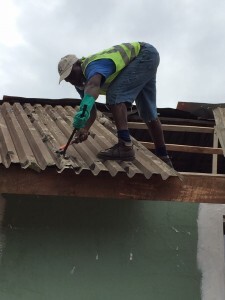 This past week, as I have had the chance to observe a number of Liberian craftsmen up close, I have been struck with just how resourceful they are with their limited access to tools, transportation, or technology. As I watch them work on the new bathroom that we are creating in our little office and apartment here in Monrovia, I have imagined what this process would look like at my home in Pennsylvania. There would be the same assortment of personnel needed: the carpenter, plumber, electrician, mason, tiler, and in our case also, a roofer. Each of them would have a large pickup truck or shiny cargo van parked out in our driveway jammed with ladders, hoses, power tools, tool boxes, all varieties of nails, screws, couplings, and other hardware, and maybe even a portable work station, compressor, and generator. These Liberian craftsmen, some with helpers, arrive each day on foot, maybe also having taken a taxi from somewhere else in the city, carrying their essential tools in hand. The plumber has only a wrench, a chisel, and a blade from a small hacksaw (he had to borrow a hammer from another man to break through the concrete walls and floor.) The mason/tiler has his two trowels and a tile nipper. The carpenter, who is also the roofer, has a little sack holding a hammer, screwdriver, 8-inch square, scissors, tape measure, planer, chisel, and a small, 16” hand saw. The electrician also has a small sack of hand tools, and he was able to borrow a ladder in order to get up into the rafters to do the wiring. The carpenter will borrow the same ladder when he starts work on the roof. At lunchtime in the U.S., the guys might run out to Wawa or open up their lunchboxes, having, of course brought their own thermoses or water bottles. 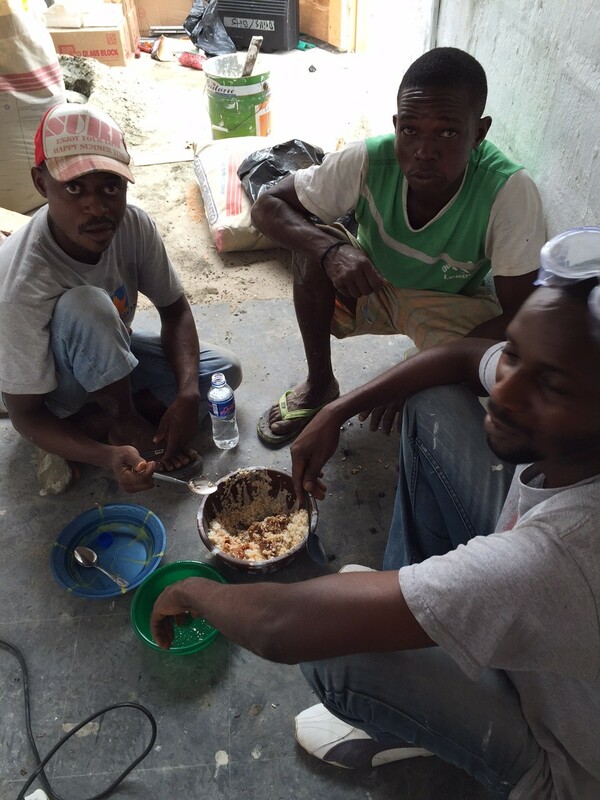 Here in Liberia, the men have no water bottles, have eaten no breakfast, and around 1 in the afternoon are glad to share a gallon pot of rice and gravy – eating with their hands out of the same pot – that the foreman (in our case, the carpenter) has bought from a nearby vendor for them. They were thankful that we provided them with bottles of water and an occasional soda. Their quiet simplicity, creativity, and teamwork are beautiful to watch. If one worker lacks a tool, another will share his or jump up to help. When one doesn’t have a staple-gun or even tacks to attach a window screen to its frame, just hammering the nail head sideways into the wood will suffice. When there are no clamps to hold something firmly in place while the glue or cement sets, a few crisscrossed nails will do nicely. A deep puddle outside in the pouring rain provides a convenient basin in which to soak the wall tiles before mounting them. When five o’clock rolls around, the men pack up to leave and just smile and say, “Tomorrow.” They are tired but glad for the work, and they seem to share pride in being a part of something good and productive. On Fridays, the craftsmen look forward to being paid only about $10 per day for their labor – $50 for a full week…and the helpers are glad to receive even just $4 per day. Somehow, it is enough for them to “make do.” And oh how they will enjoy their weekend, especially celebrating with singing and clapping and dancing up to the front to give their offerings (usually three collections!) at church on Sunday. Having had the chance to sit and watch these simple rhythms and to observe the happy fruit of their humble labor I have to confess that I am saddened by our need for and dependency upon so much “stuff” back at home. It costs us so much more to live to sustain our desires for more and better technology and equipment and its required storage, transport, and maintenance. If only we could take to heart the admonition of Jesus in Luke 12:15, “Watch out! Be on your guard against all kinds of greed; life does not consist in an abundance of possessions.” The Author of life (Acts 3:15), after all, knows something of what true life is all about. I, personally, have found this life while losing it – letting go of my grip on lots of “stuff” over these past dozen or so years in which I have determined to serve the poor. In some cases, He has had to peel away my fingers from those things that I love or depend upon the most. Working in Sub-Saharan Africa has given me an intensive course in letting go, and I have tried hard to be content in all circumstances. Cold showers are still not pleasant for me, but I am learning to be thankful for the fact that I have a shower and not just a bucket. Power outages are not as frustrating when I remember how blessed we are to at least have electricity in our room at all. Car breakdowns are not so bad when I think about the majority of people here who do not even have a bicycle, let alone a motorcycle or car. Making do with just our two meals a day (“1-0-1”, as Liberians would say) is still a whole lot better than living on only one meal per day (“0-0-1”) as most Liberians do. But on this visit, at this particular time, I am not just convinced of the necessity of letting go and “making do,” I am inspired to do so through the compelling examples of these resilient, resourceful Liberian people. I came here to teach and to help awaken hope, but have become the humbled learner, even more eager to serve but also to be taught by these precious ones whose road is much harder but whose burdens are incredibly lighter.